Download "HOW TO CONFIGURE PASS-THRU PROXY FOR ORACLE APPLICATIONS"
4 the application server. This option is useful if your company has restrictive policies about opening firewall ports to access the IVE. When using this option, we recommend that each hostname alias contains the same domain substring as your IVE hostname and that you upload a wild card server certificate to the IVE in the format: *.domain.com. For example, if your IVE is iveserver.yourcompany.com, then a hostname alias should be in the format appserver.yourcompany.com and the wild card certificate format would be *.yourcompany.com. If you do not use a wild card certificate, then a client s browser issues a certificate name check warning when a user browses to an application server, because the application server hostname alias does not match the certificate domain name. This behavior does not prevent a user from accessing the application server, however. Configuration Resource Policy -> Rewriting -> Pass-through Proxy tab 1. Use the Rewriting > Pass-through Proxy tab to write a Web resource policy that specifies Web applications for which the IVE performs minimal intermediation. 2. To create a pass-through proxy resource policy, you need to specify two things: Which Web application to intermediate with the pass-through proxy How the IVE listens for client requests to the application server 3. In the Web console, choose Resource Policies > Web > Rewriting > Pass-through Proxy. On the Pass-through Proxy Policies page, click New Policy and enter: 1) A name to label this policy. 2) A description of the policy (optional). 4. In the URL field, specify the application server hostname and the port used to access the application internally. Note that you cannot enter a URL in this field. 5. Choose the way in which you want to enable the pass-through proxy feature: Use virtual hostname If you choose this option, specify a hostname alias for the application server. When the IVE receives a client request for the application server hostname alias, it forwards the request to the specified application server port in the URL field. Important: If you choose this option, you must also define the IVE name and hostname in the Network Identity section of the System > Network > Internal Port tab. Use IVE port If you choose this option, specify a unique IVE port in the range The IVE listens for client requests to the application server on the specified IVE port and forwards any requests to the application server port specified in the URL field. 6. In the Action section, specify the method for the IVE to use to intermediate traffic: Rewrite XML Rewrite external links 7. Click Save Changes. 5 8. On the Pass-through Proxy Policies page, order the policies according to how you want the IVE to evaluate them. Keep in mind that once the IVE matches the application requested by the user to an application specified in a policy s (or a detailed rule s) Resource list, it performs the specified action and stops processing policies. 9. If you select: Use virtual hostname, you must also: 1) Add an entry for each application server hostname alias in your external DNS that resolves to the IVE. 2) Upload a wildcard server certificate to the IVE (recommended). Use IVE port, open traffic to the IVE port you specified for the application server in your corporate firewall. Note: If your application listens on multiple ports, configure each application port as a separate pass-through proxy entry with a separate IVE port. If you intend to access the server using different hostnames or IP addresses, configure each of those options separately; in this case, you may use the same IVE port. 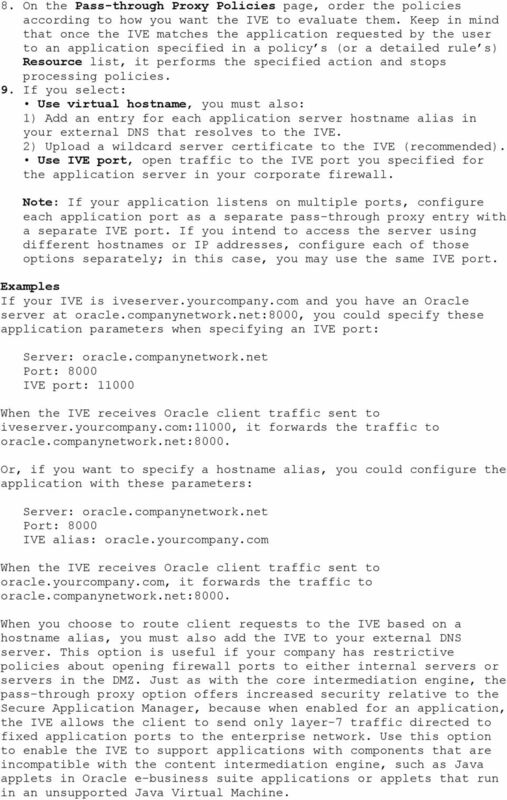 Examples If your IVE is iveserver.yourcompany.com and you have an Oracle server at oracle.companynetwork.net:8000, you could specify these application parameters when specifying an IVE port: Server: oracle.companynetwork.net Port: 8000 IVE port: When the IVE receives Oracle client traffic sent to iveserver.yourcompany.com:11000, it forwards the traffic to oracle.companynetwork.net:8000. 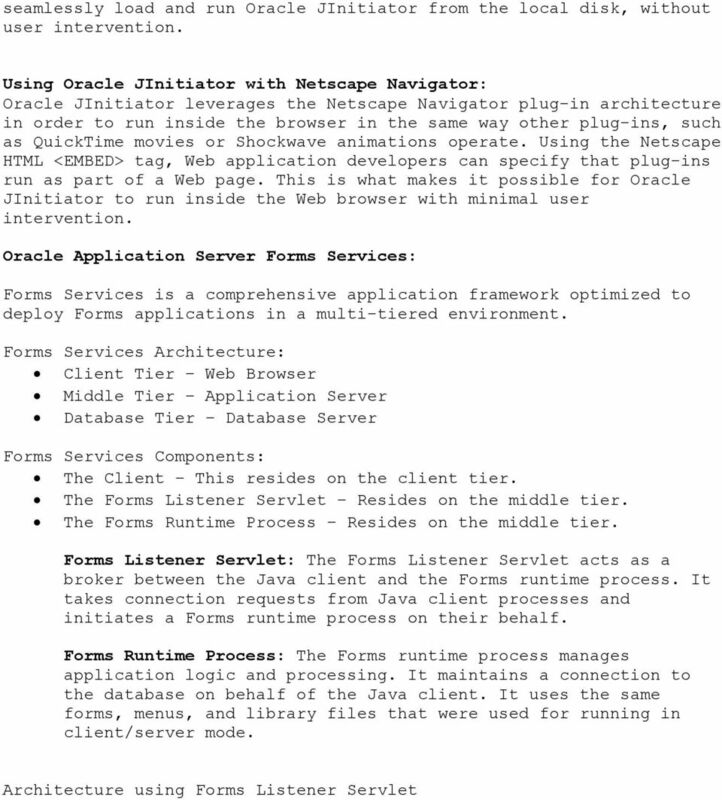 Or, if you want to specify a hostname alias, you could configure the application with these parameters: Server: oracle.companynetwork.net Port: 8000 IVE alias: oracle.yourcompany.com When the IVE receives Oracle client traffic sent to oracle.yourcompany.com, it forwards the traffic to oracle.companynetwork.net:8000. When you choose to route client requests to the IVE based on a hostname alias, you must also add the IVE to your external DNS server. This option is useful if your company has restrictive policies about opening firewall ports to either internal servers or servers in the DMZ. Just as with the core intermediation engine, the pass-through proxy option offers increased security relative to the Secure Application Manager, because when enabled for an application, the IVE allows the client to send only layer-7 traffic directed to fixed application ports to the enterprise network. 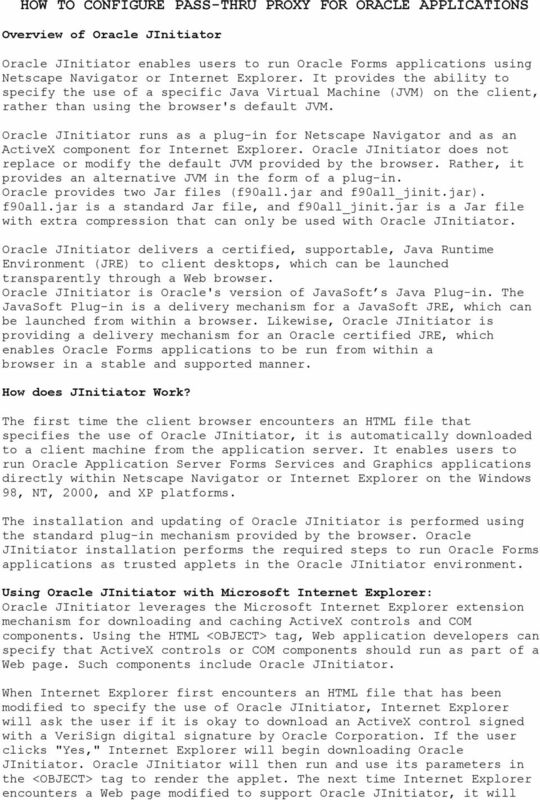 Use this option to enable the IVE to support applications with components that are incompatible with the content intermediation engine, such as Java applets in Oracle e-business suite applications or applets that run in an unsupported Java Virtual Machine. M86 Web Filter USER GUIDE for M86 Mobile Security Client Software Version: 5.0.00 Document Version: 02.01.12 M86 WEB FILTER USER GUIDE FOR M86 MOBILE SECURITY CLIENT 2012 M86 Security All rights reserved. Name Services (DNS): This is Quick rule will enable the Domain Name Services on the firewall. Deploying the Barracuda Load Balancer with Office Communications Server 2007 R2. Office Communications Server Overview. WebEx Remote Access White Paper. The CBORD Group, Inc.